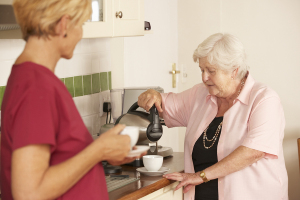 What Kinds of Routines Does Your Senior Loved One Need? As a family caregiver, you’ll find that your senior loved one will thrive if you’re able to give her some solid routines. They’ll also help you to stay on track with meeting all of your loved one’s many needs. Your loved one’s morning routine might consist of getting up, having breakfast, and maybe checking the news and the weather. If that’s been her routine for a long time, you might want to stick as closely to that as possible. Keeping a regular wakeup time for her can help her to stay on target with her sleep. In the evening, your loved one might need a little extra help winding down and letting her body know that it’s close to time to sleep. An evening routine might include clearing the dishes together, reading for a bit, and having a cup of warm tea before settling down for bed. Some activities are ones that your loved one is only going to engage in once or twice a week. These types of routines might include going to the senior center for an afternoon of board games, going to the hair salon, or even meeting up with some of her friends for lunch. Having an exercise routine is actually very important for your senior loved one. Be sure to talk with her doctor about whether it’s alright for your loved one to exercise, how much she should exercise, and what types of exercise are right for her. As your loved one grows older, she may not need as elaborate a bathing and grooming routine as she used to have. She may do better bathing every other day, for example, and may need to have her hair washed less frequently. Your senior loved one needs to have some fun just as much as you do. If the local senior center offers classes and activities, they may have a set weekly schedule from which your loved one can pick. Or she may simply enjoy engaging in different activities throughout the week, such as doing art activities one day and making music other days. Work with your loved one to figure out the best routine for her. Once you realize which main types of routines your loved one already has, you can adjust them to meet her changing needs. For Senior Care Services in Atoka TN, please contact the caring staff at Personal Care Services MidSouth today! This entry was posted in Senior Care Atoka TN and tagged Senior Care Atoka TN. Bookmark the permalink.